It's Iditarod Race Year 33! Ketchikan, Alaska - Excitement has built to a feverish pitch among mushers and fans as they ready for the 33rd running of Alaska's world famous Iditarod dogsled race, scheduled to start March 5. A "false spring" several weeks ago rained away a little too much of the Wasilla area's snow cover, so the start of the race has been moved about thirty miles up the Parks highway to the small town of Willow, always just a little colder and more dependably snow-covered. There each team of eager and excited dogs will dance and pull against their halters until they sprint into the initial dash of the long miles they will pull together toward the finish line in Nome, 1100 miles away! The weatherman predicts a low of 26 degrees and high of 37 for Willow Saturday - good enough weather for such a momentous day. And more daylight has returned to almost-springtime Alaska, and mushers will have at least 12 hours of sunlight all the way to Nome. 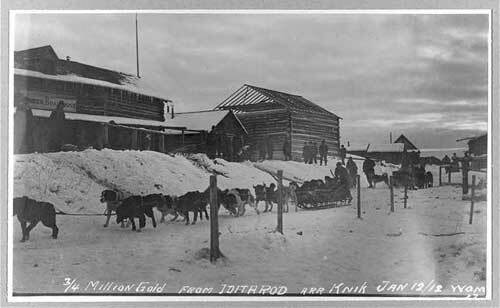 The Gold Rush mining camp that sprang up in 1910 and blossomed overnight into a big city on the flatlands near the Innoko and Iditarod Rivers. 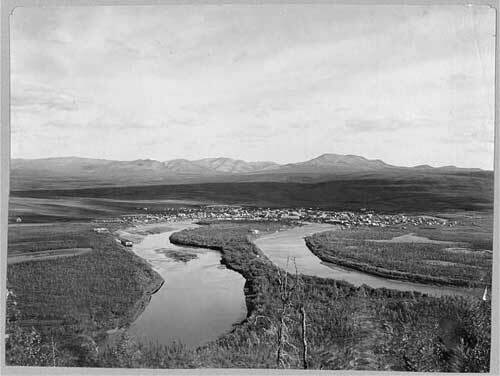 View of the town of Iditarod, mountains and streams [between ca. 1900 and ca. 1930] - Forms part of: Frank and Frances Carpenter collection (Library of Congress). Gift; Mrs. W. Chapin Huntington; 1951. Photograph courtesy the Library of Congress Prints and Photographs Division Washington, D.C.
Today's Iditarod races memorialize the extraordinary midwinter Serum Run of 1925, a deadly serious dogsled relay race across winter-dark Alaska's vastness to deliver diphtheria serum to Nome, where an outbreak of the dreaded disease threatened the lives of the town's children. The serum arrived in time to prevent an epidemic. And the Iditarod Races also memorialize, if only in the name of the races, the drama of the impossibly remote country in which the courageous town of Iditarod, Alaska, blossomed - the very last golden city of the Great Alaskan Gold Rush! That historic town of Iditarod was the last hurrah of a gold fever that has gripped the adventurous from the beginning of time. Today Iditarod is a hollow and echoing ghost town, but who's to say the ghosts of the mushers aren't still hovering over their old trail today. Weather conditions along the 1100-mile trail through the heart of Alaska to Nome this year are reported to be excellent. A field of some 80 mushers are ready to urge their well trained teams of sled dogs into that first mad dash out of Willow as they set out to conquer the Iditarod Trail! The now-famous trail is not a groomed thoroughfare through the snow but a primitive track through the impossibly remote expanses populated only by bear, moose and wolves that may or may not tolerate human intrusion. Some of the mushers are veterans of the trail and some are rookies. Among the rookies this year is a young Oregon woman, a 19-year-old legally blind girl who will be racing to test her personal courage in overcoming her handicap, even in Alaska's sometimes overwhelming wilderness. She will run with a visual interpreter at her side ­ and an agent and publisher in the background. Not all of her fellow competitors or the longtime fans of the grueling Iditarod race are pleased about the news-absorption over her entry, an interest that could overshadow the stamina, courage and luck of all the other mushers in the Last Great Race. This 2005 "odd year" of the race will follow the southern loop route of the Iditarod race that every year mushes through the immense and unforgiving expanses of Alaska's Interior. On even-numbered years the race follows a slightly easier northern loop that avoids a long stretch of southern northbound trail that faces the bitter headwinds along the frozen Yukon River. Both end at the finish line in Nome. Only portions of today's trail follow stretches of the original, historic Iditarod Trail. Now, a century after the trail first experienced the madness of Gold Rush mania, the 1100-mile-long Iditarod Trail still climbs over sled-navigable mountainsides and passes to continue on to cross immense stretches of moonscape, treeless tundra. While today's Iditarod route is different in a few respects from the original trail, it looks exactly like it did a century ago! And its heaviest traffic is at Iditarod Race time! While the Iditarod Trail itself has shifted its course slightly over the years, the original purpose of this sub-Arctic wilderness trail system has changed little in thousands of years. It was Alaska's earliest expressway, connecting native village with village and, centuries later, one Gold Rush roadhouse or shelter with another. When the Russians claimed ownership of Alaska, that undefined, gigantic northwestern chunk of the North American continent back in the early 1800s, the wide-eyed newcomers, the Russian fur traders, built trading posts not only in the friendlier expanses of Southeastern Alaska but in both Athabaskan Indian and in the remote Eskimo country farther north as well. The Russians discovered that the mainland natives used strong and sometimes savage dogs to pull their sleds, unlike their familiar Siberian neighbors, who used the more docile reindeer for the same purposes. * The Russians followed suit and hauled their own trade goods on sleds with teams of dogs. In fact, the Russians are said to have improved on the native sleds by adding handlebars and other innovations. Those early native Alaskans traveled to and from summer and winter camps, and they traveled to trade with their neighbors or sometimes to wage war against them. They knew the trails they had made and could follow those others had made. The ancient trails became the base for more modern trails -- and became the template for today's Iditarod trail. When white Gold Rushers came into the picture near the turn of the 20th Century, they also followed the established trails of the native Alaskans. The Iditarod trail was just one of them. As far as anyone knows, the name Iditarod means something like "that far place." It may have originally been the name of a long abandoned and almost forgotten native village in the area. Iditarod then became the name of a Gold Rush mining camp that sprang up in 1910 and blossomed overnight into a big city on the flatlands near the Innoko and Iditarod Rivers, in the middle of the nowhere. Just year after the first nail was driven in the first building on First Street, the town had grown from a camp to a city of 4,000! The town of Iditarod was a sister city to the nearby community which boasted a more prosaic name, Flat - named perhaps for the topography. Prints and Photographs Division Washington, D.C.
Gold had been discovered at Flat on Christmas Day of 1908, the widest paystreak ever found in gold-rich Alaska! It took a remarkably short time for the news of the strike to spread all across Alaska, and soon stampeders had covered all those miles of frozen trail to set up camp to prospect for even more sites. And they found them. The nearby town of Iditarod was a wide-open city of thousands with every amenity known to civilization at the time - gaslights, telephones, and eventually even a motor car! A tramway connected Flat with Iditarod. While the town of Flat was actually the main and major strike in the region, it was the name Iditarod that caught the fancy of the journalists and others who reported on the dazzling events and trials of the "big" twin cities. Twice in 1911 major fires threatened to completely destroy the by-then-modern city of Iditarod, but the residents doggedly rebuilt even after losing entire city blocks to conflagrations. Total losses in one of the fires ­ of a hotel, restaurant and saloon -- as reported in the Iditarod Pioneer, was put at $26,500 plus $6,000 worth of prized beer stored in the basement, a shipment from Bartels Brewing Company of Fairbanks. The Iditarod-Flat strike of 1908-1910 was to be -- unknown at the time -- the last great strike and stampede of Alaska Gold Rush! The fabled Gold Rush was over. There were no more legendary bonanzas. The twin towns gradually faded as the mines were depleted; the disappointed left the towns to the still optimistic who also finally departed. By the mid-1920s the town had shrunk and in 1925 the post office in Iditarod was closed, the beginning of the end. But by the time the mines had closed, some $33 million dollars of gold had been taken out! Today the little town of Flat has just a few summer tenants, oldtimers who continue their love of the search for gold. Iditarod is now an echoing ghost town of empty buildings and memories, an empty shell that nearby natives call "spooky and haunted." Those now-ramshackle and empty structures that are gradually succumbing to time and weather are, and should be remembered as, the Last Hurrah of a great period in Alaska's history! The ghost town of Iditarod is just one of the checkpoints and way-stations along the race route of today's Iditarod. The trail was begun when entrepreneurs from the year-round, ice-free port of Seward, Alaska, to ensure their own town's future as a center of commerce, kept the beginnings of the trail passable for those who embarked from ships in their ice-free port to begin their trek into the future. Later the Alaska Road Commission undertook the task of grooming the Iditarod Trail and extended it all the way to the Bering Sea town of Nome. Today the Iditarod Trail remains a major route in the curious transportation corridors of still-remote Alaska. In its heyday, the trail sported roadhouses, shelters and other amenities for the steady stream of travelers along its route. Today, the checkpoints along the dogsled racers' route take advantage of some of those Gold Rush way-stations. The racers and their dogs must rest along the way, and accommodations, except at a few of the way-stops, can be called primitive. But that won't matter to the mushers who will head out Saturday to participate in the Last Great Race on Earth! They and their dogs have trained for this day, are ready and eager to start down the trail that will, with luck, take them over the finish line. And in ten days, two weeks, even more, whenever, we'll all know who triumphed over the wilderness and ran with joy under the triumphant burled arch at Nome, their ears pulsing with exertion, relief and the delight of the finish. The old sourdoughs of Circle, Nome, Fairbanks, Wiseman, Livengood, and all the other Gold Rush camps of Alaska were familiar with the siren song in the quest for gold, the triumphant notes that may still vibrate within the abandoned halls of ghost town Iditarod - and in the ears of all the mushers reaching Nome. Because they faced the trail and they finished! They won. *There was a time when early missionary Sheldon Jackson was convinced that Alaska's native people should also use reindeer to pull their sleds! His reasoning was logical enough ­ in times of famine and other emergencies, the people could eat reindeer meat. And reindeer found their own feed on the plentiful lichen of most parts of Alaska. But Alaska's native still preferred their dogs.